A Secret Agent Society Family Kit is provided to every family as they move through the SAS Small Group program with a trained SAS Facilitator. The SAS Computer Game teaches children about recognising and regulating emotions and social skills through the theme of training as cadet secret agents. The game is designed to engage children in the learning and practicing of social and emotional skills. It also provides an electronic platform for debriefing social situations and computer based home mission recording. The SAS Cadet Handbook is used in sessions and at home to guide learning through the SAS group program. The Cadet Handbook includes large full-colour illustrations of new skills, group session activities, questions, home missions and a secret agent journal for recording how children use their SAS skills in real life. The SAS Parent Workbook is used in parent sessions and provides parents with a lasting summary of what children learn in the program and tips on how they can help their child use these skills in everyday life. The SAS Teacher Tip Sheet Pack is provided to teachers incrementally, aligned with the child’s progress through the program. This pack contains information sheets, and questionnaires to help school staff support children’s social skill development. 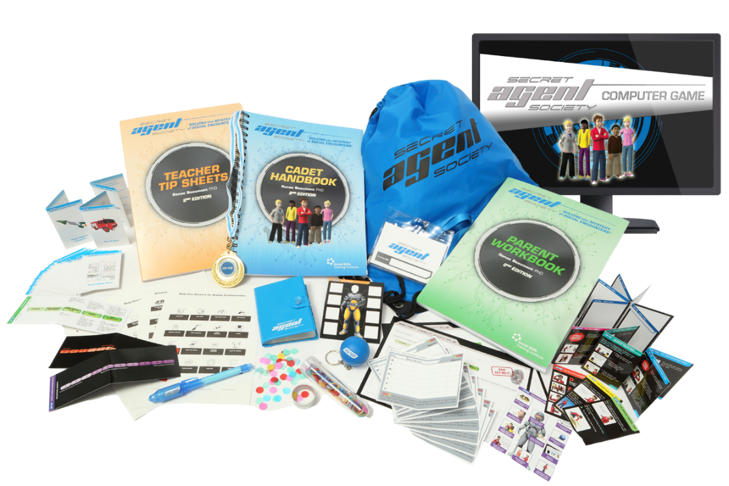 The SAS Gadget Pack contains pocket-sized illustrated skill code cards, a code card holder, Emotionometers (emotion thermometers), sticker sheets, an ID tag, Fact File cards, invisible ink pen, Friendship Formula tube, stress ball, Skill Tracker cards and a graduation medal. These fun resources are introduced to children strategically through the program. The SAS Drawstring Satchel Bag for kids to carry their resources to and from session. Simply order your SAS Family Kits online Delivered to your home, clinic, or school!